Republished from November 9, 2014 with edits – Twenty years ago today history was made and an entire pro wrestling industry changed forever. Shawn Michaels defeated Bret Hart at WWE Survivor Series 1997 in the most controversial finish of our generation in what is now known as the Montreal Screwjob. Screwjob finishes weren’t so rare in the early days of pro wrestling. Pro wrestling champions were often picked on their ability to shoot in the ring or handle themselves in these kinds of predicaments. It wasn’t out of character for a territory promoter to go rogue and have their local wrestler attempt to beat the champion and go against the script. What made this one so legendary were the people involved, the soap opera leading up to the match, and the fact that millions of people have been able to watch it. The issues between Bret Hart and Shawn Michaels were legendary in and out of the ring at the time. I worked for ECW as a ring announcer at the time and it was pretty common to hear some of the boys who had worked for the WWE (or WWF) talk about Bret vs. Shawn and choose sides. More often than not it was Bret Hart who had the support of his fellow wrestling brothers and sisters. Yet nobody had any idea that the biggest villain in this entire mess was the puppet master himself. Bret Hart and Shawn Michaels have both talked about their issues publicly for years. The best perspective came in 2011 when both sat down together for a WWE Home Video to talk about what had happened, what led up to it, and why it happened. Both more or less agreed that while the original intent of planting the rumors of outside of the ring heat was to stir up an angle for a WrestleMania rematch, it was their own inability to separate fact from fiction that let this one spiral out of control. The documentary Wrestling with Shadows gave fans an incredible perspective from Bret Hart’s side after the Survivor Series. The documentary chronicled the weeks leading up to Survivor Series 1997 and the fallout after the match. 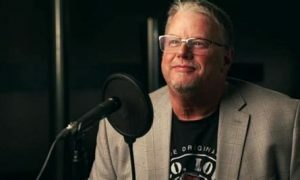 In a nutshell the documentary portrayed Bret as conflicted over signing a multi-million dollar deal with WCW and the tensions he had with Vince McMahon leading up to his big match. Of course Shawn and Bret have since written books going into great detail about the legendary night but it was Dave Meltzer in a series of Wrestling Observer newsletters that gave more detail than anyone into the background leading up to Survivor Series. What happened more or less was Vince McMahon making the ultimate pro wrestling promoter mistake by allowing his world champion to sign a contract with a rival promotion while at the same time giving his world champion creative control of how he was booked. It was arguably the biggest mistake in Vince’s tenure as WWF promoter. Business was not good for the WWE that year and Vince had to make a decision. Vince had given Bret a 20-year contract a year earlier that would roll into Bret working behind the scenes after he retired with the WWE. Vince wanted out of the deal and allowed Bret as champion to see if he could still get a deal with WCW (Bret negotiated with both in 1996 and chose the WWE over the WCW deal). The landscape was different, WCW revenue was up, and Bret landed a deal that Vince couldn’t match. Bret gave notice and this is where everything fell apart. Vince wanted Bret to drop the title to Shawn at Survivor Series 1997. Bret used his creative control and refused. Bret has since said that the only reason he said “no” was because Shawn told him that he wouldn’t put him over. Bret offered several alternatives including dropping the title to Ken Shamrock in the United States. Vince insisted on Shawn which Bret refused. Bret also was stern on not dropping the title in Canada. The resolution was that everyone agreed on a DQ finish in Montreal and that Bret would relinquish the WWE title to Vince McMahon on RAW the next day, which included Bret giving some kind of a shoot interview on RAW explaining his heel actions and praising Vince. Vince was still on the fence, influenced most notably by the night Alundra Blaze showed up on WCW Nitro and dropped the WWE women’s title in a trash can. Eric Bischoff has said numerous times that he would never had done that with Bret, specifically citing legal issues between WWE and WCW. Bret has also said numerous times that he never would have allowed it. Yet it was a phone conversation between Vince, Shawn, and Triple H that changed Vince’s mind on the DQ finish. 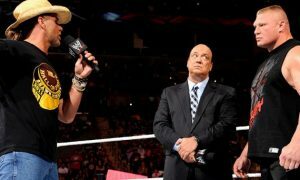 Triple H has taken credit in as being the one to speak up and protest the idea of Bret leaving as WWE champion. The plan was apparently put in place to set Bret up in a Sharpshooter, ring the bell, and change the championship on Vince’s terms. This is how Meltzer described the planned finish in the November 17, 1997 edition of the Wrestling Observer. We all know what happened from there. The November 9 match was fascinating to watch as the problems between Bret and Shawn outside of the ring were legendary. Would Bret hit Shawn? How would they work together? Surprisingly to some, they worked together like pros. It was more of a brawl early on than a match but it worked. The memorable finish came when Bret climbed to the top rope to come down on Shawn, but Michaels pulled Earl Hebner in the way who took Bret’s double sledge. Michaels looked at McMahon who was at ringside and put Bret in the sharpshooter as planned. In the famous final seconds Mike Ciota ran in as Hebner was down, Hebner got up, Shawn locked in the hold, gave Bret his leg for the reverse, and Hebner quickly looked at the timekeeper and screamed “ring the bell!” Vince elbowed the timekeeper and screamed “ring the f***king bell!” The bell rang and it was all over. The aftermath is as legendary as the sharpshooter itself. Bret spit directly at Vince McMahon in the face. Bret then went on the warpath and destroyed WWE monitors. Bret finger painted “WCW” in the air to all four corners of the ring. In the dressing room he confronted Michaels who pleaded ignorance, obviously lying to his face. According to several reports it was The Undertaker who demanded that Vince McMahon that he needed to apologize to Bret. Now in the Wrestling with Shadows Vince is shown entering Bret’s dressing room but the cameras were not allowed in. This is reportedly where Bret told Vince to leave or he was going to punch him, in addition to calling him a liar. Reportedly Bret finished getting dressed and a scuffle broke out which saw Bret drop Vince with a punch to the jaw. Shane McMahon reportedly jumped on Bret’s back at which point Davey Boy Smith pulled Shane off and hyperextended his knee in the process. Bret reportedly asked Vince if he was going to screw him on money at which point Vince said no. The documentary cameras then caught Vince groggily walking out of the dressing room. Now there have been skeptics in the business that have for years doubted that this was indeed a screwjob at all. I have talked to at least a handful of wrestlers that have sworn the whole thing was a big work between everyone. The only piece of evidence that always had me doubting the validity of all of this was the punch. The documentary cameras caught everything but the punch, which to me is the most pivotal moment in the story. I always doubted whether this punch really took place because if it didn’t, this whole thing was a sham. Fifteen years later these guys have all done a great job of convincing me that this was all real but I have always been skeptical of why everything was on tape but the punch. To show my ignorance at the time, I presumed that Vince McMahon was done at this point. “Who could ever trust that guy again?” I remember having a telephone conversation with Chris Jericho a few days after the incident. Jericho was on the verge of becoming a free agent in a little over a year. I asked that same question to Chris who explained to me that it would become irrelevant when it comes to guys negotiating deals. Now this was at a time where it was rumored that Chris already had some kind of working deal in place with the WWE down the line. Coming from a guy who was a close friend of the Hart family really opened up my eyes at the big picture. The fallout from this was ironically great for everyone involved. 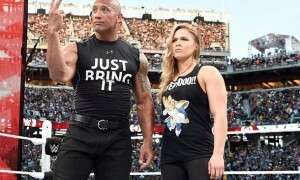 The WWE didn’t run away from this story, they embraced it. The story became the catalyst for the Vince McMahon heel character which some would say was the greatest drawing heel in pro wrestling history. That heel character became the villain in the biggest feud in WWE history between Steve Austin and Vince McMahon. The story turned business around and would eventually put WCW out of business and launch the Attitude Era into full motion. Bret wound up going to WCW and earning millions of dollars over the next couple of years. Bret also participated in a spinoff angle at Starrcade 1997 involving Hulk Hogan and Sting. Bret’s career in WCW was never what it was in the WWE but at his age, but it was the money that was the biggest coup. Unfortunately Bret suffered several tragedies outside of the ring which have been thoroughly documented. I always thought that Bret would return to the WWE when his WCW deal was up, wrestle Shawn Michaels, and draw the biggest WrestleMania buyrate in history. It was never to be. Shawn Michaels had a great career and was never impacted at all by that infamous night. In fact, Shawn returned to the ring after a lengthy layoff and became one of the most popular WWE stars during his final run. New fans had no idea about the Montreal Screwjob or seemed to care about the villainous act Shawn Michaels portrayed in 1997. Even brief references to that night weren’t enough to damage the enormous fan support Shawn gained over the years. Bret Hart eventually returned to the WWE as a performer in 2010. Bret returned earlier to be inducted into the WWE Hall of Fame but it was a one-night appearance. Bret signed on to return at the start of a TNA-WWE Monday Night War which lasted only a matter of weeks. Bret made peace with Shawn on his first night back but would eventually wrestle Vince McMahon at WrestleMania. For a number of reasons, the match never lived up to the hype. A goofy car accident angle leading up to the match certainly didn’t help. Bret wrestled a few more matches and actually won the U.S. title. Bret continues to pop up from time to time and is in the process of working with the WWE on launching a new DVD. Who was right and who was wrong? It is really tough to say. For me, I always thought that Vince McMahon as the promoter had the right to do what he thought he needed to do for business. His biggest mistake was allowing a guy with creative control to win his WWE title and freely negotiate as champion. Many have come out and criticized Bret Hart as taking his role as a pro wrestling champion too seriously, citing that wrestling is a work anyway. I have always felt that Bret bordered on just being overall obnoxious about this over the years and failed to take responsibility for his part in it. Bret’s father was a promoter and should have understood more than anyone that Vince had the right to do what he felt he needed to do with his championship. At the same time he was savvy enough to negotiate creative control so it was in his right to exercise it. Regardless of who was right and who was wrong, everyone came away as winners after the Survivor Series. At the end of the day pro wrestling is a business and if the idea of business is to make the most money, than everyone involved capitalized on the controversy. Many have tried to script finishes to play off of the Survivor Series but the authenticity of that infamous night in Montreal is virtually impossible to duplicate which is why that we probably won’t see a finish as legendary as this in our lifetime. Happy 20th anniversary Montreal Screwjob. You changed the business forever!